The Ackerman Ponds show how quickly a goose-infested area can be turned into a destination for butterflies and honey bees. Constructed in 2010-2011, the two grass and stone ponds were part of the storm water facilities for the Ohio State University’s Woody Hayes Athletic Complex. The stone slows the storm water flow, prevents erosion, and encourages particles to settle out of the water. Though designed to be dry between rains, the Ackerman Ponds were often full of water due to a persistent leak from an adjacent water main. This submerged and distressed the lawn grasses and became a nesting area for Canada geese. In addition to being a nuisance, Canada geese droppings degraded the retained water. Once the water main was fixed, the water receded and the geese left, but the distressed vegetation had to be addressed. In 2014, volunteers from Friends of the Lower Olentangy Watershed (FLOW) and WOSU planted native forbs, grasses, two hackberry trees and one burr oak tree. 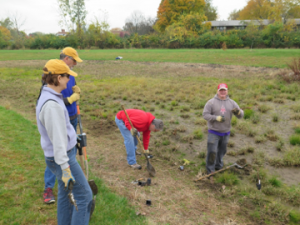 Ohio State Facilities Operations and Development – Landscape Services planted an additional dozen native trees from the School of Forestry’s greenhouse. These trees included oak, locust, cherry and hickory, among others. After one year, the native foliage has grown at an impressive rate. In addition, the native perennial flowers have already begun to attract butterflies and honey bees. These ponds continue to provide stormwater retention, and the plants help filter the stormwater and provide habitat for pollinators and other wildlife. Thanks to Lush Cosmetics for funding for this exciting project. What is a Watershed? How can we Monitor its Health? During this meeting, you will learn what a watershed is, how they function and how we, the people, can affect the health of a watershed. We will also introduce FLOW’s Water Steward Program, which we are carrying out with the support of partners at Ohio Water Resources Center and the Sierra Club. We will learn about the different components of the program including the water chemistry testing and macroinvertebtrate sampling that our volunteers will perform. If you are participating in the Water Steward Training Program, this course is optional. If you are not interested in macroinvertebrate sampling, this meeting and training is not required. This meeting will provide insight into the kind of time commitment that will be required of you and your team (1-2 hours, 3 times per year), an overview of the sampling and identification process, and how all the data will be compiled and used at FLOW. If you wish to do Macroinvertebrate Sampling and are unable to attend this meeting, please let us know and we will send you information regarding the in-field training. FLOW’s Water Steward Program kicks off March 22. FLOW is working with the Ohio Water Resources Center and the Sierra Club to create an active group of Water Stewards in the Lower Olentangy Watershed. These stewards are dedicated to a sustained hands-on effort to quantify the health of our stream waters through the monitoring and reporting of chemical and macroinvertebrate indicators in several of its tributaries. In order to be a part of the FLOW Water Steward Program you must be trained in WARN (Water Alert Report Training) and either the Water Sentinel (water chemistry) or the macroinvertebrate sampling methods (or in all three areas). After completing the required trainings, the Water Stewards will be grouped with one or more persons and assigned a sampling site close to their chosen geographical area (when possible) which the team will then sample in the spring, summer and fall. If this kind of stewardship is something that you would be interested in participating in please join us for the following training sessions. Details: WARN Training is required to be a water steward. However, it is likely that we will hold another training session sometime in late spring. Please let us know if you are interested but unable to attend. Details: Water Sentinel Training will enable you to test the chemical components in the water. This training is optional and if you choose not to do this training, we will try to pair you with someone that has had this training. You may try to take this training at a later date. Data collected from this training will be used by both FLOW and the Sierra Club to track stream health. Supplies will be provided for each team. This course is optional. If you are not interested in macroinvertebrate sampling, this meeting and training is not required. This meeting will provide insight into the kind of time commitment that will be required of you and your team (1-2 hours, 3 times per year), an overview of the sampling and identification process, and how all the data will be compiled and used at FLOW. If you wish to do Macroinvertebrate Sampling and are unable to attend this meeting, please let us know and we will send you information regarding the in-field training. During this event, FLOW Water Steward Trainers will walk you through an actual macro invertebrate sampling process and work with you to identify the various critters that you might find at your own site. You must have attended WARN training prior to attending this event unless other arrangements have been made with FLOW for future training events. You will each have an assigned site that you will visit with your team three times every year. This first visit you will be accompanied by a FLOW Water Steward Trainer. The trainer will show you your access points and walk you through the process so that you have the confidence you will need to go out on your own in the summer and fall. Locations and dates to be determined based on team and trainer location and availability. Once you have done your chemical and macroinvertebrate sampling, you will provide your results to FLOW so that they can be compiled into both an overall annual report as well as be used to track your specific location over time. You and your team will visit your site two more times this year. We will track the results of the sampling and share these with you on our website and hold a year end meeting so you and your fellow stewards get a chance to meet and share stories of success and fun in the streams! If you are interested in becoming a FLOW Water Steward and we look forward to seeing you and guiding you through this opportunity to work first-hand to improve the quality of our streams. 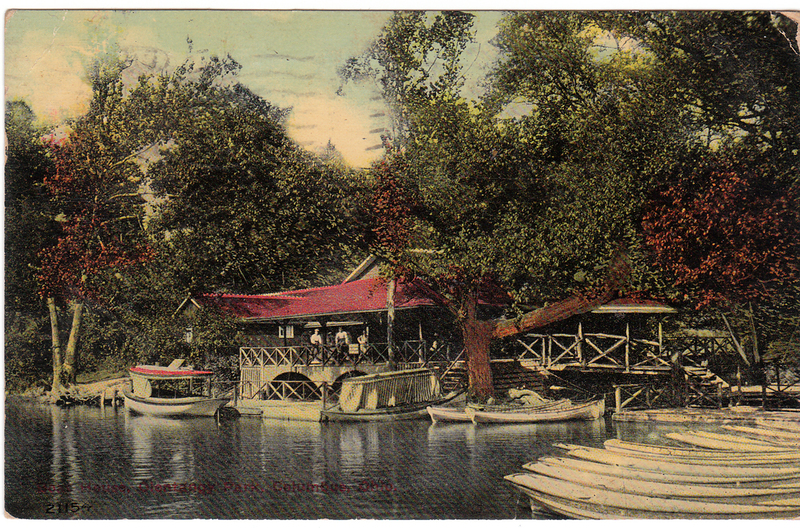 Postcard of the Lake House at Olentangy Park, 1911. Lisa Daris, an urban environmental optimist and owner of Olentangy Paddle will be the guest lecturer at the next FLOW public meeting, Monday, February 1 at 7 pm (address below). Lisa will talk about experiencing the river in a boat! She will give pointers about where to put-in, where to take-out, and share insights about the wildlife and changing health of the Olentangy. We will have a RAFFLE for FLOW shirts and a few other prizes, and we would love for you to participate! Refreshments and snacks will be provided. Please let us know if you intend to make it out! 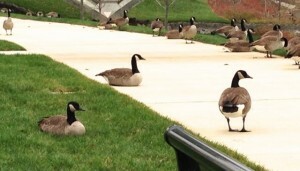 Canada Geese enjoying the Scioto Mile in downtown Columbus. Please join us for our next public information meeting 7 pm on December 7, 2015! Our guest lecturer will be Jeff Pelc from the US Department of Agriculture (USDA). He will be speaking about resident Canada geese and how to effectively manage damages associated with them. He will touch on their life history, protection status/laws, and management techniques, including examples from the Olentangy river project. Friends of the Lower Olentangy Watershed (FLOW) was presented the Green Collaborative Achievement Award at the annual Summit on Sustainability held by the Mid Ohio Regional Planning Commission (MORPC). The Green Collaborative Achievement Award recognizes a group of entities or individuals who have shown effectiveness in producing environmental accomplishments through a collaborative effort. FLOW and their partners have created a foundation of success for several on-going and new initiatives that support the fulfillment of FLOW’s mission – to keep the Olentangy River and its tributaries clean and safe for all to enjoy, through public education, volunteer activities, and coordination with local decision makers.